Frog Mortar Creek is a major tributary off of Middle River on the western shore of Maryland near Martin State Airport. Several large marinas and a couple of small anchorages dot the creek all the way to its head (seven-foot depths for most of its length). 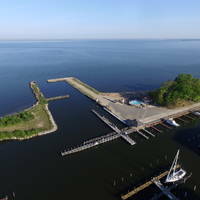 The only caveat offered for the marinas or anchorages is that Martin State Airport (nearby) is home to the Maryland Air National Guard, and flights of jet fighters and cargo transports may come and go at all hours. Generally, though, Frog Mortar Creek is peaceful and beautiful. 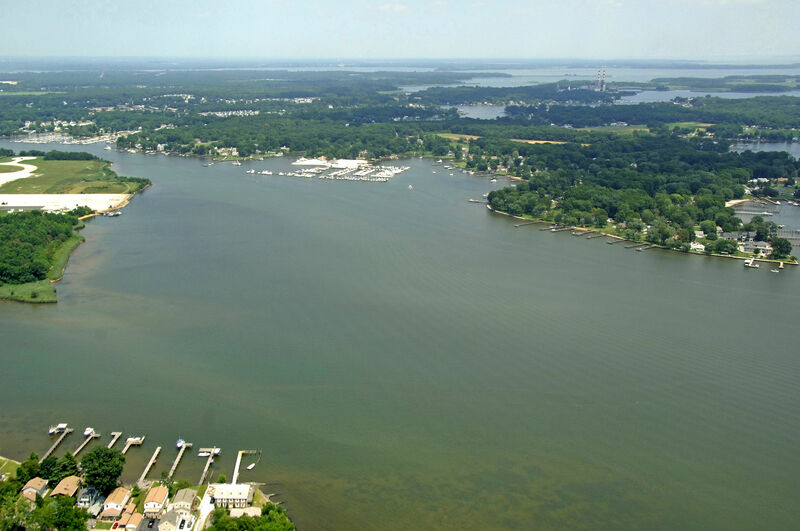 Middle River and Frog Mortar Creek are 18 miles northwest of the Chesapeake Bay Bridge and 31 miles southwest of the Chesapeake and Delaware Canal West Entrance. The image above is a view from the southwest looking northeast over the entrance to Frog Mortar Creek. Off to the left (the large white patch of concrete) is the main runway for Martin State Airport, which is home to the Maryland Air National Guard. 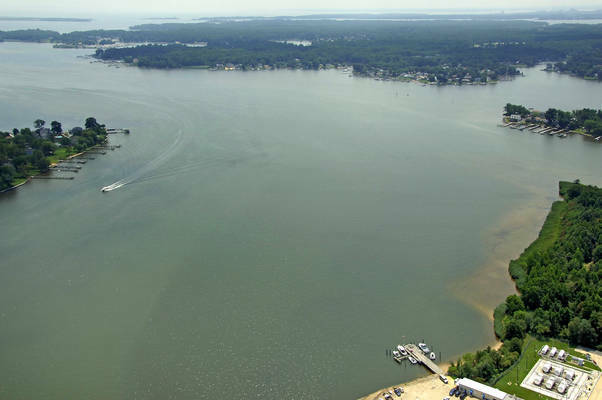 To the right of the large marina in the center of the image is Galloway Point, while a glance toward the horizon in the image shows the creeks and by-waters of Seneca Creek to the north. From flashing green 5,head northwest to flashing red 6, and then set a course of about 315 degrees magnetic for about 1.4 miles to an unnumbered flashing (2+1) light near the mouth of Frog Mortar Creek and Martin State Airport. Once you have reached the flashing red (2+1) light, simply turn north into the creek where you will find seven- to 12-foot depths. There are daybeacons farther up the creek to guide you safely past a couple of shoals. The first marina in Frog Mortar Creek is the expansive Long Beach Marina, which has transient slips, gas and diesel fuel, and a lift for haul-out and repairs. 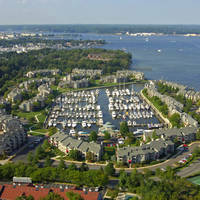 This is the largest visible marina in the picture above. 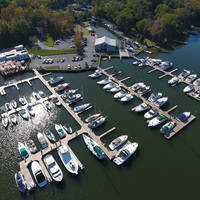 Farther upstream (to the left of Long Beach Marina) are Maryland Marina (transient slips, haul-out and repairs), Edwards Boatyard (repairs only), and then Tradewinds Marina (transient slips, haul-out and repairs). There are plenty of places to drop the hook in Frog Mortar Creek, but be sure to stay out of the main channel. No reviews yet! Be the first to write a review of Frog Mortar Creek Inlet.